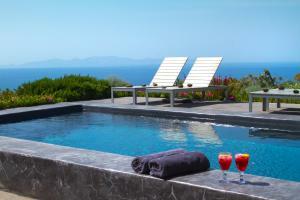 270 Oias View offers self-contained villas with private pools and panoramic views of the Aegean Sea. This complex is built respecting the local architecture and is located at 700 meters from the picturesque center of the town of Oia. This elegantly decorated villa has a private pool with panoramic views of the Aegean Sea, the sunset and the town of Oia. It also consists of 2 bedrooms, 3 bathrooms with power shower, fully equipped kitchen and living room with built-in sofas, flat-screen satellite TV, DVD player and iPod docking station. In addition, this villa at 2 levels includes free WiFi. This villa of 3 plants enjoys panoramic views of the Aegean Sea, the sunset and the town of Oia and has a private pool with sun terrace and outdoor dining area. The accommodation features elegant decor in white tones and features carefully selected objects, 4 bedrooms, 4 bathrooms, 2 living rooms and fully equipped kitchen. It also includes a flat-screen TV, free Wi-Fi and hydromassage showers. 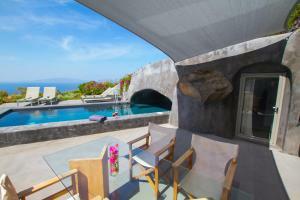 This cave-style villa has a private pool and sun terrace with panoramic views of the Aegean Sea and the town of Oia. Featuring elegant décor inspired by local architecture, the accommodation features an 1 open-plan bedroom with an adjoining sitting area with built-in sofas and a fully equipped kitchen. In addition, it has a bathroom with shower or whirlpool bath and another bathroom with shower. There is free WiFi. Featuring a minimalist décor, this air-conditioned 2 villa has a private pool with a spacious outdoor seating area overlooking the Aegean Sea and Oia. It also consists of 2 bedrooms with private bathrooms, an open-plan bedroom area with an additional bathroom, a seating area and a large dining area with a fully equipped kitchen. 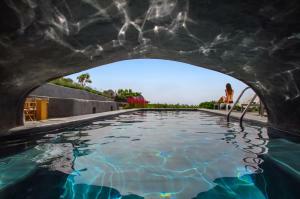 This air-conditioned villa is housed in a cave house and features minimalist décor. 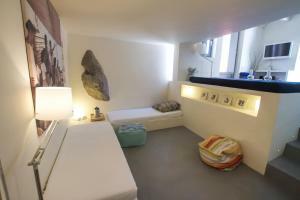 It has a private pool and offers views of the Aegean Sea and Oia. It has an open-plan bedroom with an adjacent living area, a fully equipped kitchen and a bathroom with a hydromassage shower. This 3 villa has minimalist décor and a private pool with views of the Aegean Sea, the sunset and Oia. It also consists of air conditioning, 4 bedrooms, 4 bathrooms, living room and fully equipped kitchen. next articleDo you already know with what suitcase to go on holiday to the island of Santorini?